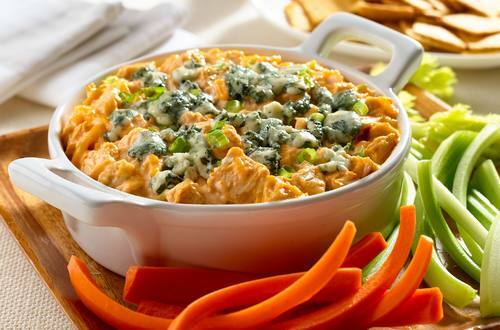 Put some of our creamy buffalo chicken cheese dip on a chip or a vegetable and experience pure bliss! This easy dip recipe will be a party's favorite! 2 Toss chicken with cayenne pepper sauce. Stir in remaining ingredients except blue cheese. Turn into 1-1/2-quart shallow casserole, then sprinkle with blue cheese. 3 Bake uncovered 20 minutes or until bubbling. Serve, if desired, with celery and/or your favorite dippers. Cost per 2-Tablespoon serving*: $0.36.